Gearing up to launch its ‘world car’ by 2010, International Cars & Motors Ltd. (ICML) has entered into a technical collaboration with renowned Italian design house Pininfarina. 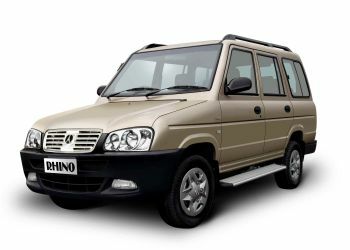 Photo: ICML's current range is spearheaded by the Rhino SUV. Gearing up to launch its ‘world car’ by 2010, International Cars & Motors Ltd. (ICML) has entered into a technical collaboration with renowned Italian design house Pininfarina. The Hoshiarpur-based company will invest about Rs.700 crore in the design and production of the world car. “Apart from the designing support, Pininfarina will lend consultancy support to the making of these cars that would be first launched in Europe followed by India. With the engineering of Pininfarina, these cars would be unique in terms of safety, design and style,” ICML Managing Director Deepak Mittal told The Hindu. The entire engineering and designing of the car would be carried out under the guidance and supervision of Pininfarina in Italy. The objective was to make cars appealing to different markets and segments. Initially, two world cars would be launched in the market, out of which one would be a 7-seater sports utility vehicle (SUV) and other a 5-seater high-end luxury car. The quality of these cars would be on a par with global products, said Mr. Mittal. “The kit of the car will be produced in the ICML’s Amb facility in Himachal Pradesh and then finally assembled in Italy. The assembling facility will be set up in Europe, followed by Southeast Asia and the U.S. The production capacity of the new car would be 50,000 units annually. This will be a versatile platform as it will consist of a family of vehicles that will also include SUVs, multi-utility vehicles (MUVs) and high-end luxury cars,” Mr. Mittal added. Stating that Pininfarina has a proven track record of bringing about some of the iconic international brands like Ferrari, Maserati, Jaguar and Volvo, Pininfarina S.p.A. President Andrea Pininfarina said: “ICML’s world car is in line with our philosophy to innovate and exceed our benchmarks. World car offers the most distinguished and sophisticated piece of engineering in the segment complementing the new age elite segment. We believe that India is soon going to be the next global auto market which is also one of the reasons for Pininfarina to venture into this country."